I have always adored peanut butter, but when I came across Justin’s fabulous looking line of Nut Butters at my local Whole Foods, I was dying to give it a try and compare it to my beloved peanut butter. The majority of their nut butters are almond based, as opposed to peanut. Almonds are one of, if not THE healthiest nut you can eat, and I love finding ways to incorporate more nuts in my diet. 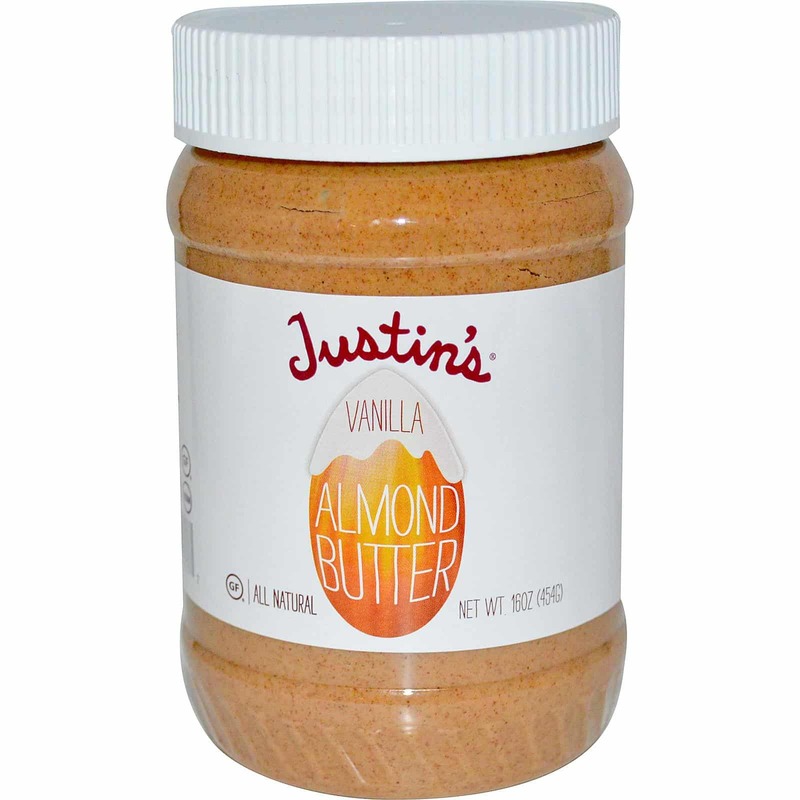 Plus, Justin’s Nut Butters offer a selection of six amazing flavors: Classic Almond, Honey Almond, Maple Almond, Chocolate Almond, Vanilla Almond and Chocolate Hazelnut, in addition to also offering a Classic Peanut Butter and Honey Peanut Butter. So I grabbed myself a jar of the Vanilla Almond Butter, and a few packets of other flavors to sample (yes, they also come in portion controlled packets, people!) I decided to try my new almond butter in a very basic way…spread onto some apple slices. OH EM GEE. It was absolutely divine! The flavor of the almond comes through perfectly, with just the slightest hint of vanilla. And I loved how fresh this product tasted…like it was literally made from scratch in my kitchen. I was thrilled with how absolutely delicious this stuff was! MOVE OVER PEANUT BUTTER. Keep in mind though, this is a nut butter, so in order to incorporate it into my Weight Watchers plan, I can’t go overboard with it. It is a healthy fat though, so a serving size of 2 tbsp for 5 Points is ideal. Keep reading to learn more about Justin’s Nut Butters…PLUS get my Weight Watchers Recipe for Light Chocolate Fudge Brownies with a Vanilla Almond Butter swirl! Extremely thick, moist, chewy fudge-y like brownies that are made with Greek yogurt and topped off with a decadent Vanilla Almond Butter Swirl, all for just 4 Points. Ignore all instructions on back of brownie mix box. Preheat oven to 350 and spray a 9″ x 13″ baking dish with nonfat cooking spray. Combine all ingredients (except the nut butter) together in a medium sized bowl. Pour into baking dish. Dollop the almond butter onto the brownie mix, and swirl around a bit with a fork. Place in oven, and cook about 22 minutes, or until a knife comes out clean when stuck in the center. Remove from oven and let cool for at least 15 minutes, then cut equally into 18 pieces.